The man in the suit is meant to be the guy from Ancient Aliens. I'd welcome any advice on how I can make him look better, as I struggle a lot with drawing characters at this scale. @Zanorin, looks great already, don't think you should add anything if you don't have a specific idea. Sorry for not sending enough WIPs here, but I haven't done much to my piece now. I guess I just want to end it already and send a finished version, so don't even know if I'm gonna change anything from now. Btw, why postimages (?) instead of Imgur? 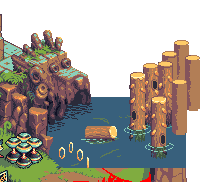 finished #1, not super fond of the trees but this tile took way too long. as always may update later on. 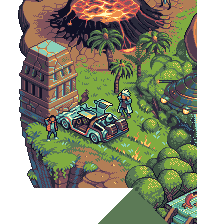 I want to redo the forest edge, add a bit more texture to the sand and grass, and figure out what to do with the UFO beam to make it look less rocket propulsion. Then I think I'll be done. @notnull; the forest in this scale should not look like a generic texture (like it would be on a much smaller scale). The edge of the forest should show visible trees. Spectacular job sgm, very good connection of two sides. Damn, sorry haven't been back. New job etc etc. Can I claim the tile back? No worries if not. I did have 38. I see that 30 is back in WIP. Need to check against my WIP? Hi, i did a review of my previous Tiles. @Minord; amazing improvements mate, hats off! Awesome tile! Predator is a nice touch. I think I'll go for 83. @Dobermann; I think the pool and the edge of the roof together should move northwest a few pixels. I dont understand. 23 is GhostPlayer, he doesn't border my tile? Sorry everyone, I'm going to have to let my tile go. I just won't have time to finish and be able to respond to changes. 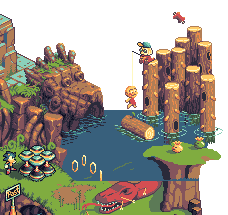 I've got to travel for work now so I'll probably have to drop pixel art all together for the forseeable. Thanks for giving me a shot though and feel free to continue with my WIP if needed. Don't think anyone was working off it yet. Hey mate, sorry you feel that way. Collabs (by the name of them) require some interaction back and forth. So when someone is absent for a month, many things change. Please come back when you have some free time! @speedycube, the tile is pixelled nicely, but what are the mammoths doing? melting into a portal? Your previous water texture was way better. This is an amazing tile sgm, I dig the lighting on that teeth. Edit; if you're looking for more tiles to make, you can do 31, 52 & 66. I think I'll go for 46 to make a noah's ark. The beginnings of my new tile. I'm pretty much sketching first at this point and I'd like to add the sl*g Brothers from Wacky Races (they are two cavemen). I want one to stare confusedly at the big fly and the other will be added later (no idea for what his action is going to be, maybe he could be reacting to the structures to the right?). I'm a bit clueless on how to make the first sl*g Brother's arm/hand positions readable though, I want to have him scratching his chin with his right hand while the other one just hangs around carrying a club (which is also WIP, I don't like how it looks right now) and of course make sure it's all iso, but at this moment I'm having a bit of a hard time conveying the former with what few pixels I get to place without making the hand too big. Any tips? Thanks! Might be too late for fixing, but you messed up the alignment of the bang going around the building (the frieze and architrave), mixing up the roof and frieze. @Dobermann & Night; like this actually, 45 degrees and a straight line.